Dear Valued Customers, here is our August MDR Update. I’m sure everyone is eager to receive our monthly update for August and I know you are all expecting me to say it will take another week or so before we can ship the first batch of MDR’s but unfortunately that won’t be the case. 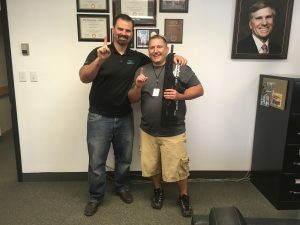 In truth we held our MDR launch party on July 21 and delivered the first production MDR to Derek Johnson from Texas. Derek waited on the phone on hold with our office for several hours to be the very first person to order an MDR. 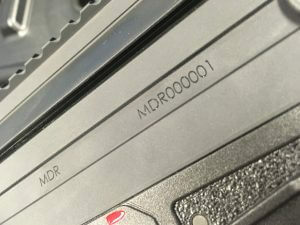 We will be sharing the MDR launch video with everyone late next week after marketing finishes compiling it. We spent several weeks testing samples of the final production guns to ensure there were no reliability or endurance problems and we are happy to report they are flawless! We are very pleased with the MDR’s performance and I know everyone else will be too. The first batch of MDR’s will start shipping this week and the remainder of the batch will all be shipped by the end of next week. The color mix of this first batch is 60% FDE and 40% Black. Every batch will be split up proportionally between dealers and end users based on when they placed their orders. We have dealers and end users who jumped on board in the beginning and we are sticking to that priority schedule until we fulfill the entire backlog. I would expect it will take us 6-8 months to catch up on the backlog as we are continually receiving new orders daily and I’m sure that will increase substantially once the rifles hit the stores. Truth-fully I am very excited to say this will be our last monthly MDR update because the product has officially launched and from this point on we will be continually producing and shipping MDR batches as quickly as possible. For those who placed their orders on our website you can login and check for delivery updates on your orders. Dealers can call and check with their sales representative. The 5.56 is pushed out due to the .308 delays, when we know more details on timing for the 5.56 we will provide an update. I truly appreciate those fans and customers who didn’t lose faith in our team, I hope the nay-sayers will change their tune when they get their hands on MDR’s at their local dealers. 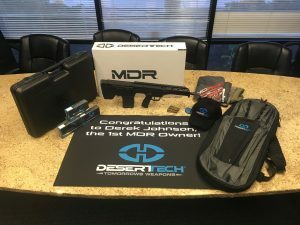 The MDR launch took much longer than we predicted, and it was a very painful journey for us at Desert Tech. Lastly, I want to express my sincere gratitude to my staff members who hung in there with me for this bumpy ride because not a lot of people could stomach the hard work and harassment that we went through to get the MDR to market and their loyalty and hard work is above price! I just wish I was higher up in the queue. Congratultions Nick, to you and the whole team. It take a lot of courage, talent and perseverance to develop and manufacture truly innovative products. As a right handed individual who is left eye dominant I am grateful for the most ambi rifle ever. I do however, admire the unyielding resolve demonstrated by you and your company, not only toward getting the product completed, but doing so in keeping with the high standards that you had set for yourselves. All of it while under tremendous pressure–positive and negative–from the entire firearm enthusiast community. To stay focused in the face of such fanfare and urging is a quality idealized by many companies but realized by few. As a left handed but right eye dominant shooter, I expect that I too will soon be very grateful very shortly. Great work and congratulations! DT. Rumor has it that it was worth the wait! It’s a firearms dream come true. Forward ejection thank you!! Fully ambi yea baby. Very interested to understand the safety feature of the blow back system. For all the crybabies and negativity paddlers , y’all can eat desert tech crow! Great to see all of your hard work come to fruition. I look forward to receiving mine, whenever the 5.56 starts shipping. 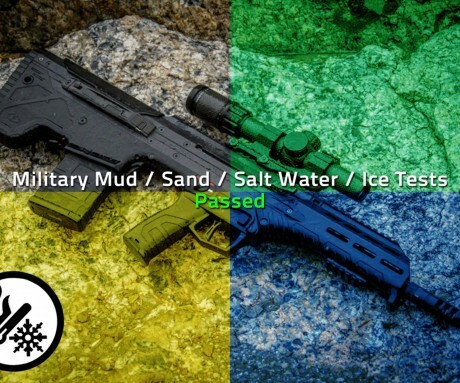 Is there still plans for a 9mm conversion kit in the future? 1) Can you update the delivery times on our accounts? 2) Next day or two day shipping is the very least you guys can do. 3) I see a lot of swag goodies in the above pic… Are we all getting similar packages??? 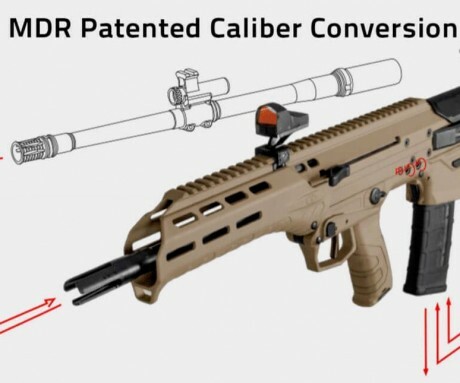 Is there a California compliant version of the MDR for us poor citizens of California? There will be soon, we are working on it. Any future plans for 6.5 Creedmoor conversion? would be awesome! Ordered mine 2 years ago. I’m excited. 6.5 creedmoo variant is pointless IMO since the .308 is the one that was made. The 6.5CM is far from pointless. 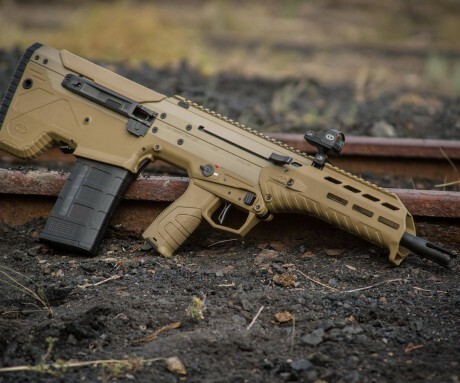 Better ballistics than a 308, and less recoil, but most importantly because people are asking for it. Can’t agree more with 6.5 CM. I would however like to know where my pre order is 3 months after launch.